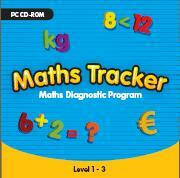 Maths Tracker is a computer-based Maths Diagnostic program specially designed for pupils who are experiencing difficulties with the 1st, 2nd and 3rd class revised Mathematics curriculum. These class levels correspond to Levels 1, 2 and 3 respectively. Each level consists of three tests, with each test containing fifty multiple choice type questions. On completion of each test, a report is generated highlighting the strengths and weaknesses of a particular pupil across the various strand units of the Mathematics curriculum. New feature includes save facility for test results! The results of these individual tests can then be combined to produce a more complete Pupil Profile. Both the test report sheet and the Pupil Profile can be printed and are ideal for IEPs etc! For a more indepth look, please click on the cover picture to the left.